Invite others to share the warmth of a Christmas baby shower with you. Celebrating the gift of life takes on a magical warm touch as friends and family enjoy the lights and warmth of the holidays. Send a recipe card with the invitation. Ask them to write down their favorite holiday recipe to put in the new mom's holiday cookbook. Welcome To the North Pole! - Decorate your front door as a backdrop. Take pictures of your guests with the mommy to be as they arrive at the North Pole. She can then send a copy of the picture with her thank you cards or use it in a fun scrapbook to share with the baby when it gets older. Holiday Cookbook-Arrange for guests to bring their favorite Christmas recipe to the baby shower to share with the mommy. Set out a card style album for guests to decorate their recipes for a fun holiday recipe book for the mommy to use. Set out pens, markers, ribbon, stickers, and embellishments for guests to get creative with. Have extra cards available for people who might have forgotten to bring theirs. Baby's Firsts- Decorate Christmas items for the baby to enjoy for its first Christmas. You can set out a stocking, Santa hat, onesies or any other baby clothing. Use fabric paints, glitter, gemstone jewelry, ribbon and stencils to help guests create the perfect first Christmas for baby. Which Santa Baby Is Who? - Collect baby pictures of the guests coming to the baby shower. Prepare Santa hat cutouts from construction or scrap booking paper and tape to a poster board or the wall. Attach a number to each Santa baby. The guests must guess which baby picture belongs to which guest. The person with the most correct answers wins a prize. Present Game Pass - Since Christmas is just around the corner, a gift game would be fun to play at the baby shower. Wrap gifts to use, one for each guest. You can have everyone pass the gifts to a story or to Christmas music. Another fun idea would to start with all of the gifts in a pile in the center of the room. Start with one side of the room and go around the group in a circle. Each person can choose to pick from the pile or steal from someone else. Set a rule for stealing gifts, such as each gift can only be stolen twice. For a little extra fun - add a few gag gifts to the group of presents. It will add lots of fun and excitement as people realize they have one of the gags. Use your Christmas decorations as your backdrop to create a festive setting. By using Christmas lights and candles, you can add elegance to the baby shower. If you have a large picture on the wall, you can wrap it like a gift for a fun table background. Fill glass jars with ornaments for an inexpensive and festive touch. 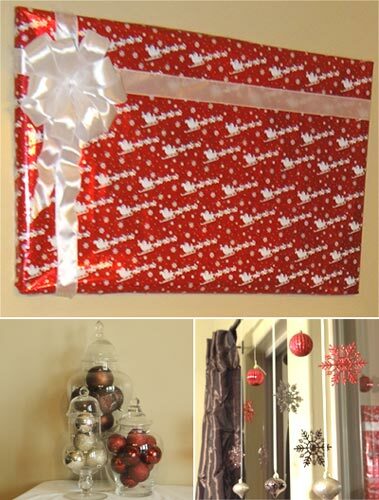 You can also hang ornaments off of your curtain rods. I used white sheer ribbon and fishing line to hang the ornaments in the picture above. 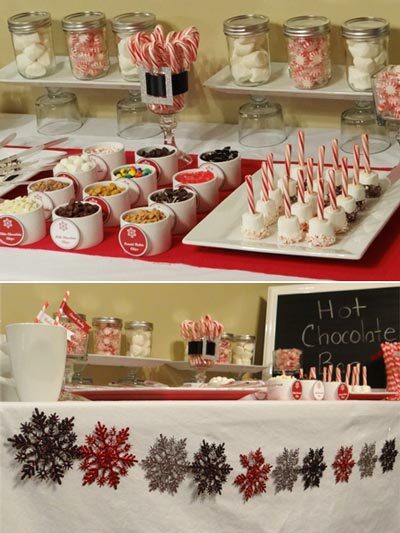 Another fun decorating idea is to use peppermints and marshmallows as your decorations. To add height to the table above, I turned trifle dishes upside down and placed white serving plates on top of them to add some height. Then I filled an assortment of jars with peppermints, candy canes and marshmallows. Hang your favors on the Christmas tree to add to the festive feeling. Place mirrors around the room to reflect the soft glow of the lights. Hang some mistletoe at a door opening with a cute sign that says, "Kiss the baby!" Decorate the room with presents, garland, and any other Christmas memorabilia that add to the warm feeling. 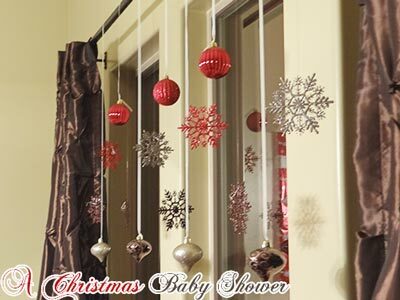 String up some Christmas chains around the room with the baby colors. You can also number each chain as a countdown to baby's birthday and give it to the mommy to use. The season is full of warm and comforting foods. Share your Christmas spirit with your guests by offering delicious goodies for them to enjoy. Some good holiday food ideas could be eggnog, cocoa with peppermint candy canes, cookies and milk, fudge, gingerbread men, pumpkin pie, cheesecake, and caramel popcorn. Cookie Name Tags- If you are arranging a sit down meal, use decorated cookies as the name cards. Write the guest's names on each cookie for a fun, edible touch. 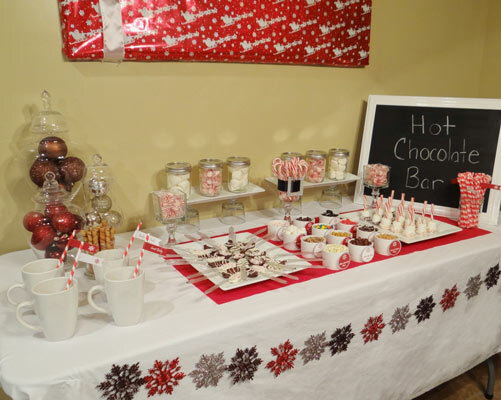 Put together a hot chocolate bar for your guests to enjoy. 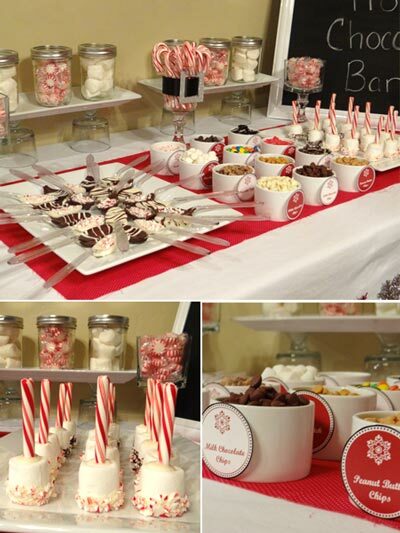 Offer lots of fun mix ins and toppings for your guests to make their own custom creations. My favorite mix-in was white chocolate with peppermint. Yum! Mix ins I used for my hot chocolate bar: milk chocolate chips, semi-sweet chocolate chips, mini m&ms, peppermint, thin mints, peanut butter chips, butterscotch chips, cinnamon chips, oreos, marshmallows, chocolate toffee, white chocolate chips. To add interest to my table, I used mason jars filled with white and red items to match the theme. I filled mine with marshmallows and peppermint candies. To get the height I wanted, I turned trifle jars over and placed a serving trays on top. I also created my own glass jar containers to hold more peppermints and candy canes. The Santa belt look was created with black satin ribbon and some sparkly scrapbooking paper that I cut to look like a belt buckle. The snowflake banner was actually made by stringing some glitter ornaments onto fishing line. 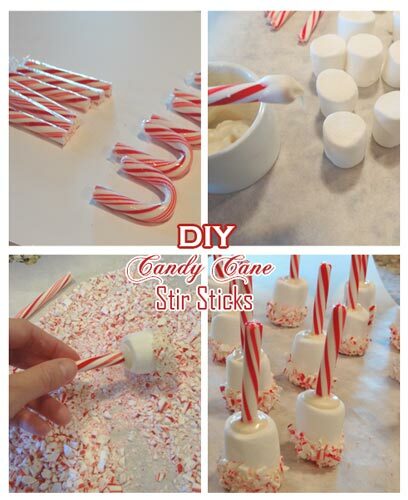 Step 1: Cut the arch off of the candy canes to make your stirring stick. Step 2: Melt white chocolate in microwave in 30 second intervals until fully melted. Dip the cut end of candy cane into the chocolate and push into marshmallow. Step 3: Dip outside end of marshmallow in white chocolate and roll in crushed candy canes. Step 4: Set on wax paper to dry. Store in airtight container. Tabletop Christmas Tree- decorate a miniature Christmas tree to go on your gift and food tables. If you know the baby's gender, you can decorate it with the colors of blue or pink or decorate it to match your theme. Use Christmas decorations to decorate your food table. Place some poinsettias, garland, or grapevine on the table. Weave in silk flowers, berries, baby's breath or anything else that reminds you of Christmas. 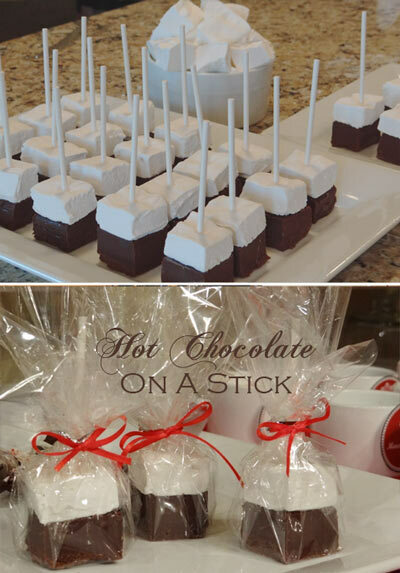 Make a fun chocolate favor for your guests to enjoy when they get home. Hot chocolate on a stick! It's a homemade marshmallow stacked on homemade chocolate. Pure genius! So cute and super yummy! Wrap in cellophane for an easy and portable favor they will love. Baby's first Christmas is a magical time for a family to experience. If the baby will arrive before Christmas, some themed gifts would be wonderful. We put together some of our favorite gifts to go with baby's first Christmas. some ideas would be mint lip gloss, lotions, Christmas cookies or candy, ornaments, and packages of hot cocoa with a mini candy cane tied to it. Play Christmas music for your guests to get them in the Christmas spirit. It would be fun to use any music that have the word "baby" in it, like the "Santa Baby" music cd.